Discussion in 'Help Wanted' started by heems, Feb 2, 2014. Hopefully an easy one for you all. I am trying to replace the battery on my 2008 Pitbull and need assistance. I have the seat removed, but the battery has a rubber band over it holding it down tight. I think I need to remove the battery side covers in order to release/loosen the band, but don't know how. Any input is appreciated. Just stretch the strap to one side and unhook the clip down the side of the battery that your stretching it to. There are 4 screws - two towards the front and two towards the back under the black plastic inserts. The strap is solid steel (covered with a thin rubber band) so no stretching possible. One side of the band ties via the lug nut as shown in the post above. Glad you got it figured out might suggest a braille from auto anything tell them you are a member here and get a discount. :iagree: What Tom said! I use Yuasa and its holding strong... two years already. If I could find Braille I would buy Braille though! Not to hijack this thread, but... If I have to remove my side cover how to I remove the studs shown in this picture. My service manual shows bolts not these thingamabobs. I've been afraid to pull up on them too hard. 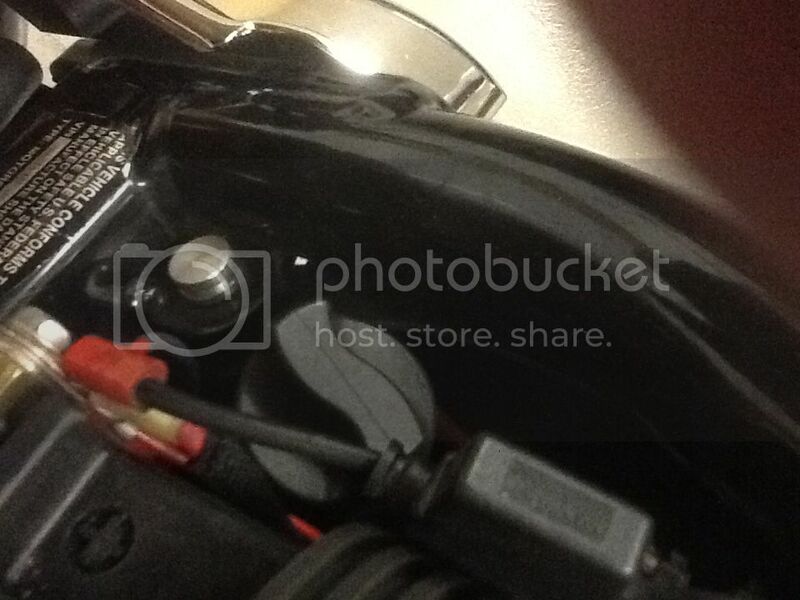 The current battery is a Deca (model EXT20L) that Strokers put in and it lasted 2 years and 3 months. I guess given the Dallas summers that's not all that bad. I researched a bunch of threads on this site and understand Braille and Tamioka are the top contenders. I gather that's mostly due to their very high CCA. However, one data point I couldn't get is whether those last any longer (i.e. 3+ years) than the regular high performance (310 CCA range) batteries. 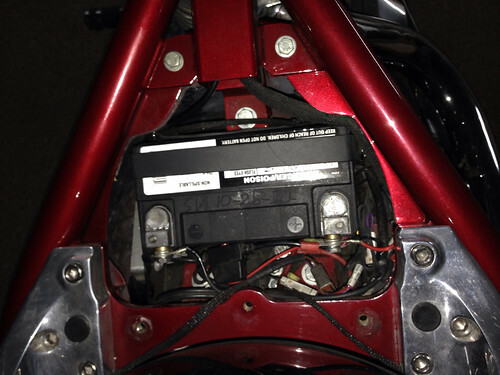 So given my Deca experience and also now that I am in San Diego with fairer weather, I opted for another 310CCA battery at $97 shipped - YTX20HL-BS Battery | Yuasa Motocross 12 Volt Motorcycle Batteries. Also, I didn't know about the BDB discount and all the online sites were listing the Braille at $199 so that was my comparison point. That's my logic anyhow. Will let you all know if it's a total pos. Cheers. I can't wait to pull the battery out of the bike I'm working on right now, and see what it is. This bike is very seldom on the battery tender, and doesn't have compression releases. He bought the battery, when he was down at Daytona in 07. Believe me or not, I just pulled that battery out and it's a Harley battery # 65989-97A, with a confirmed date on the side of 2007. He stores this bike at my shop, and started it up myself the first part of Dec. I told him that while we are putting some money into it this winter, we might as well change the battery because it was so old, not because it wasn't working. Why is everybody else having so much battery trouble when their keeping them on the tinder all the time? That´s the one I have on my bike, it´s been two year already and it is holding strong as the first day so far. Yuasa seems to be a good battery. Also have a Harley battery: 65989-97C. Paid $130 at the Harley dealer. Will still start the scoot if it doesn't sit longer than 10 days. No compression releases on my 107 inch S&S. Previous Harley battery lasted over 3 years also. Time to change this one. When it was new it could sit over a month without charging. Disclaimer: We don't have cold winters. Me too, together with tender all the time, no problem. After a lengthy battery research journey. Ive decided to give the Braille b2015 a shot. Pricey, but tired of carrying jumper cables. Ive read on here somewhere that an excessive amount of cca's is detrimental to the vehicle. Summit Racing is claiming 574 at 0 degrees. Whats your thoughts? If compression releases work and starter is in good order, 310cca makes pistons go like horny little rabbits in the springtime! I truly believe regular battery having much longer lifespan, not to mention the lower cost! I had HD battery for 4 years, didn't keep it on charger, but for time when I wasn't in USA. My Yuasa 310 cc is still going like new on its third year. I believe that's the one 65989-97a in my 05 mastiff outstanding battery . My 2011 mastiff however has a deka of which makes the Harley Davidson batteries however deka changed the configuration and you have to add a lead block just to consider it a different battery than the Harley Davidson. I have not had a good experience yet with the deka however I'm giving it the benefit of a doubt as it has been in the fifty degree range here and I haven't rode the bike 40 miles yet. I have had to give it a quick 2 minute charge to start the bike if it doesn't fire first time. We will see soon a s the weather warms a little.